Many generations ago, Norwegians settled in Stoughton, Wisconsin. Today, its residents continue to celebrate the early immigrants’ rich heritage, especially its dance. WUWM News traveled to the vibrant little city to drink in its biggest celebration of the year. We discovered it’s both an exciting and bittersweet event. Stoughton has Velkommen written all over it. So it’s not a great surprise that Syttende Mai, marking Norway’s constitution day, is a big deal in this little town. In fact, that’s what you’re hearing right now. We’re in the middle of the big Sunday afternoon parade. Families set up camp along the main drag, so they don’t miss a single marching band or clown that comes along. There’s even real Norwegians lining the parade route. "Per, that’s the first name. We heard about the Stoughton Syttende Mai celebration so we wanted to see it,” Per says. He says he heard the Norwegian Dancers here are out of this world. 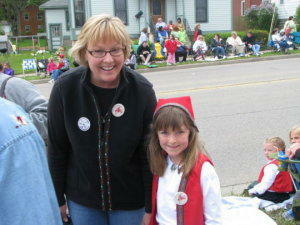 Down the street, Stephanie Stokes is waiting for the dancers’ float, that’s going to pass by pretty soon. Stephanie and a lot of other people in the crowd were members of the group when they were in high school. "And so was my mom. It started in the 50s and she was one of, not the very first year, but one of the first ones,” Stokes says. Stephanie’s young daughter, Jenna, is quiet and cute as a button. She’s wearing who’s wearing a little cap, vest and a matching swirly skirt, all in red and accented with intricate braiding. She says her grandma made her beautiful costume. I find Jenna’s grandma, Susan Slinde serving lefse at the Sons of Norway tent. She remembers dancing with the group like it was yesterday. “It was probably the most wonderful thing I did in high school,” Slinde says. James Listug is working alongside Slinde. He danced with the troupe in the late 90s. Both Slinde and Listug remember early morning rehearsals with the director, Jeanne Reek. “For the first semester they practice every single morning from 7:20 until about 8:30. In the old days, we started at seven and I walked to school both ways every day, up hill both ways. And you never wanted to be late or sick,” Listug says. “I sprained my ankle and she looked at it and said, you’re fine. Dance! And I did,” Slinde says. 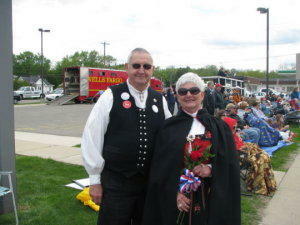 Roger Nitzsche and his wife Judy are entrenched in Stoughton’s Norwegian traditions. Roger points out the dancers, almost reverently, as their float glides before our eyes. Roger was a high school dancer 50 years ago. The Nitzche’s three daughters danced with the group too. “Yeah, it’s really hard because today will be the last performance. Everyone cries, because it’s the last time the seniors will dance. Believe me it’s sad, we’ve been through it three time with our daughters,” the Nitzche’s says. Before the tears begin to flow, the dancers dash off to Stoughton’s Community Center for one last performance. The place is packed. Norwegian or not, these twenty teenagers have mastered 45 breathtaking folk dances. They spin and leap with electric energy. Every twirl is perfectly synchronized. This performance is the last for half of the ensemble. They’re graduating. As their names are announced, each carries a rose across the auditorium to their families who are looking on. There are lots and lots of tears. Family and friends huddle together as the program ends. Senior Sarah Gulseth says the dance team is like her second family. “There’s no words to tell you how much fun it is,” Sarah says. What about sore toes? “I work through the pain, because it’s worth it, so it’s not too bad, you break them in,” Sarah says. Emily Krantz is saying goodbye too. She says when you graduate you also have ti say goodbye to your costume. Each is handed on to a dancer who takes your place. “Yeah, it’s rough. All the girls sleep in their bunads the night before they turn them in. And then you write all these notes in your purse for the next girl who gets your bunad. She’ll read it and have your bunad,” Emily says. One week after this tearful performance, ten new dancers will be chosen. Rehearsals begin right away for next year’s Syttende Mai in Stoughton. Maybe one day young Jenna Stokes, the young girl I met downtown at the parade, will be right here, wearing one of the hand-me-down bunads.